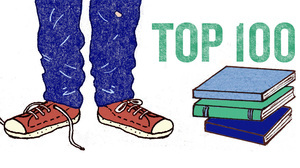 Yesterday, NPR Books released the results of the Top 100 Best-Ever Teen Novels poll. I was pretty excited to see some of my favorites on there, especially The Hobbit. I've read that book a couple of times and will probably read it again before the movie comes out. I figured Twilight would be included somewhere, and sadly, I was right. Oh well, you can't get everything. Overall, I'm pretty pleased with the list and will probably try to read some of the books on the list that I haven't read yet. Yay books!